Q:　Why is TOYO CLEAN COPPER necessary? 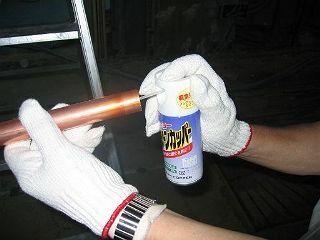 On installation of refrigeration system, copper tubes are joined by brazing. If copper tubes are brazed without TCC, inside surface of joint spots would be oxidized. The oxide scales peel off as time elapses, clog the piping system and finally damage the whole system. If you use TCC, it prevents formation of oxide scales and keeps the refrigerant system clean. You can get long life and safe operation of the system. Q:　Is there any other method to prevent formation of oxide scales? Nitrogen seal method can be used. This method, using a heavy nitrogen cylinder, works efficiently only when whole piping arrangement is put together and brazing can be done at once. On the other hand, TOYO CLEAN COPPER can be applied for the joint at work. Injection of TCC gives a strong effect for deoxidization of the inside surface of the brazing copper tube with short working time and lower cost. Q:　How does TCC protect the piping? The sprayed gas from TCC generates reductive gases by the brazing heat. It prevents forming of oxide scales on brazed spots. When boric acid is used to protect the inside surface of the copper tube from oxidation, boric acid glass coating the surface, comes off during operation, leading to the serious damage of the system. TCC contains no boric acid and also no components which corrode an inner pipe wall. Q:　What is deoxidizing gas? The deoxidization is a reverse phenomenon of the oxidation that makes a surface of copper black. When brazing, the oxidized scale inside the copper tubes is produced by oxidation of copper with oxygen in the air at high temperatures. The deoxidization gas yielded from TCC takes off oxygen from copper oxide, and also removes the oxygen gas in the air inside the copper tube. Eventually, the deoxidization gas itself changes into carbon dioxide and water. For this reason, the copper surface inside tubes is not oxidized and kept clean. It is demonstrated by experiments that the amount of copper oxide produced inside the tubes by using TCC is as small as about 1/30 in comparison with that formed by the traditional nitrogen seal method, probably because of the forcible removal of oxygen from the inside of the copper tube by TCC. Q:　How many times to spray from can for each size of tube? The table described above shows only a rule of thumb. Excessive injection of TCC gives no additional effects. Q:　Are copper caps on both ends necessary? Caps other than copper are acceptable? Please put caps on both ends to make the effect secure. They are not necessarily copper made. However, to keep the tube inside clean, use squeezed damped cloth, for example, to avoid dust. Remove the caps or other stuffing materials after slow cooling down as a basic rule of welding. Q:　How to apply TOYO CLEAN COPPER to the tubes and pipes with many brazed spots? And it's effect? TCC is intended to be sprayed to small and local brazed spots to protect the area from oxidation by generating deoxidizing gas. Never fill whole inside of tubes or pipes to avoid explosion. It works well for the tubes and pipes also with many brazed spots by spraying it to each spot. Q: Why is painting to a ferrule prohibited? Circular and even spraying in the number of times corresponding to diameter of the tube will cause a sufficient effect. Q:　What is sticky component in compounds and how does it work? It is a useful component to prevent an oxidized scale inside the pipes. Q:　Does brazed parts sometimes become dark? Yes, soot is produced when the flaming occurs by the ignition. But soot is a minute and soft particle that does not clog the pipes and does not damage the rotating machines. The same phenomenon would occur in case of the nitrogen seal method. Q:　Can we use TOYO CLEAN COPPER for the refrigerants normally used now in the world?? Yes, we can use it without any problems. Q:　Is there any effect on human body, especially by the burning smell component after heating? The gas produced by heating and burning consists mainly of carbon dioxide, water and unsaturated hydrocarbons. The carbon dioxide and water have no smell. The unsaturated hydrocarbons smell a little to a sharp human sense, and have the chemical properties similar to LPG and acetylene used for brazing. Thus, the gas generated from TCC is quite harmless unless breathing in fully occupied room. Furthermore, the quantity of the hydrocarbon gas produced from normal usage of TCC is very small. The TCC has been developed by placing priority on the human's safety rather than smell. However, as a matter of course, working area should be well ventilated. A brazing burner outside the pipes may cause flame. The heat generated from TCC sprayed of normal number of times is rather negligibly small compared to that generated from the brazing burner.